Diamonds in the Rough is a series that will take a look at some of the players in MLB The Show 17 that play better than their Overall Rating, or market value, would suggest. I’ve been using 84 Overall, San Francisco Giants 1B, Brandon Belt on-and-off as my starting 1B and bench player. He’s been pretty spectacular for me in both of those roles, and with good reason. To start, he hits well against both RHP (72 Con / 75 Pow) and LHP (70 Con / 78 Pow). With IE Boosts against RHP, he can even get higher. 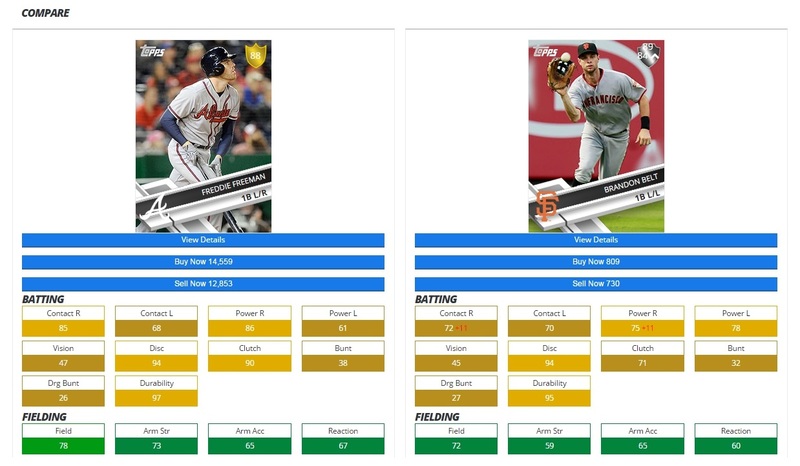 As of the time of this post, he’s receiving +11 to both his Contact and Power vs RHP boosting him to 83 and 86, respectively. With the IE Boost, he’s roughly equivalent to an un-boosted Freddie Freeman at 1/15th the price. Has SDS Made Hitting Too Easy?